Thanks for welcoming us! I greet you all and everyone, and I thank Maria Voce for her introduction ... clear, all very clear! Yes, he sees that he has clear ideas! I am very happy to be here today among you here in Loppiano, this little "city" known in the world because it was born of the Gospel and of the Gospel wants to feed itself. And for this reason it is recognized as its own city of election and inspiration by many who are disciples of Jesus, even by brothers and sisters of other religions and convictions. In Loppiano everyone feels at home! I wanted to come and visit her also because, as she pointed out to her as the inspirer, the servant of God Chiara Lubich, wants to be an illustration of the Church's mission today, as the Second Vatican Ecumenical Council traced it. And I rejoice to dialogue with you to put more and more into focus, listening to God's plan, the Loppiano project at the service of the new stage of witness and proclamation of the Gospel of Jesus to which the Holy Spirit is calling us today. I knew the questions, of course! And now I answer the questions. I've included all of them here. Holy Father good morning, we have just heard Maria Voce speak of a law of Loppiano: mutual love, the new commandment of the Gospel. And in these years we took it very seriously and we tried to ensure that it was not only a private commitment, but a collective commitment, of all. That Loppiano was founded on this commitment to live mutual love; so much so that, again in 1980, a bit 'of years ago, when we were a bit' younger, and so many people were then - and I'm here today -, Chiara has proposed us to make a real deal: that is, to write this commitment, and to sign it. And we renew it every day, and we propose it to the people who come, even for a single day, because it is only in this way that we become citizens of Loppiano. Holy Father, living the new commandment is the starting point of our Christian life and it is also the point of arrival: the goal to which we want to aim. After the period of the foundation lived with Chiara, we are now living a new phase. The time of enthusiasm may have passed for some; it is certainly more difficult to identify the ways to go to give incarnation to the prophecy of the beginnings. How to live, Holy Father, this moment? The first question you ask me, "pioneers" of Loppiano, who first, more than 50 years ago, and then gradually in the following decades, you launched in this adventure, leaving your lands, your houses and your places of work to come here to spend your life and realize this dream. First of all thank you, thank you for what you did, thank you for your faith in Jesus! It is He who did this miracle, and you [you have] put faith. And faith lets Jesus work. This is why faith works miracles, because it gives way to Jesus, and He works miracles one after the other. That's life! To you "pioneers", and to all the inhabitants of Loppiano, I spontaneously repeat the words that the Letter to the Hebrews addresses to a Christian community that lived a stage of its journey similar to yours. The Letter to the Hebrews says: "Call to mind those first days: after having received the light of Christ, you had to endure a great and painful struggle [...]. In fact [...] you have gladly accepted to be deprived of your substances, knowing that you possess better and lasting goods. Do not abandon your frankness - your parrhesia, he says - to which a great reward is reserved. You only need perseverance - of hypomoné, it is the word you use, that is to carry the weight of every day on your shoulders - because, having done the will of God, you get what has been promised "(10: 32-36). These are two key words, but in the frame of memory. That "deuteronomic" dimension of life: memory. When I do not say a Christian, but a man or a woman, he closes the key to memory, he begins to die. Please, memory. As the author of the Letter to the Hebrews says: "Call to mind those first days ...". With this frame of memory we can live, we can breathe, we can go on, and bear fruit. But if you have no memory ... The fruits of the tree are possible because the tree has roots: it is not an uprooted one. But if you have no memory, you are an uprooted, uprooted, there will be no fruit. Memory: this it is the frame of life. Here are two key words of the journey of the Christian community in this text: parrhesia and hypomoné. Courage, frankness, and endure, persevere, carry the weight of every day on your shoulders. Parresia, in the New Testament, says the style of life of the disciples of Jesus: courage and sincerity in bearing witness to the truth and at the same time trusting in God and in his mercy. Prayer must also be with parrhesia. Say things to God "in the face", with courage. Think about how our father Abraham prayed, when he had the courage to ask God to "negotiate" on the number of the righteous in Sodom: "And if they were thirty? ... And if they were twenty-five? ... And if they were fifteen ? ... "That courage to fight with God! And the courage of Moses, the great friend of God, who says to his face: "If you destroy this people, destroy me too". Courage. Fight with God in prayer. It wants parresia, parresia in life, in action, and also in prayer. Parrhesia expresses the fundamental quality of Christian life: to have the heart turned to God, to believe in his love (cf. 1 Jn 4:16), because his love drives away all false fear, every temptation to hide in quiet life, in respectability or even in a subtle hypocrisy. All woodworms that ruin the soul. It is necessary to ask the Holy Spirit for frankness, courage, parresia - always united with respect and tenderness - in witnessing to the great and beautiful works of God, which He accomplishes in us and in our midst. And even in relationships within the community one must always be sincere, open, frank, not fearful or lazy or hypocritical. No, open. Do not stand aside, to sow discord, murmur, but strive to live as sincere and courageous disciples in love and truth. This sowing discord, you know, destroys the Church, destroys the community, destroys one's life, because it also poisons you. And those who live by chatter, who always go murmuring about each other, I like to say - I see it so - that they are "terrorists", because they talk about others; but to talk about someone to destroy it is to do like the terrorist: he goes with the bomb, throws it, destroys it, and then goes quiet. No. Open, constructive, courageous in charity. And then the other word: hypomoné, which we can translate as under-being, to endure. Staying and learning to live the demanding situations that life presents to us. With this term the Apostle Paul expresses constancy and firmness in carrying forward the choice of God and new life in Christ. It is a matter of keeping this choice firm, even at the cost of difficulty and opposition, knowing that this constancy, this firmness and this patience produce hope. This is what Paul says. And hope does not disappoint (cf. Rom 5: 3-5). Put this in your head: hope never disappoints! Never disappoint! For the Apostle the foundation of perseverance is the love of God poured into our hearts with the gift of the Spirit, a love that precedes us and enables us to live with tenacity, serenity, positivity, fantasy ... and also with a little humor, even in the most difficult moments. Ask for the grace of humor. It is the human attitude that comes closest to the grace of God. Humor. I met a holy priest, busy up to the hair of things to do - he went, he went ... - but never stopped smiling. And because he had this sense of humor, those who knew him said of him: "But this is able to laugh at others, to laugh at himself and even laugh at his own shadow!" So is humor! The Letter to the Hebrews also invites us to "recall those first days", that is, to rekindle in our hearts and mind the fire of the experience from which everything was born. Chiara Lubich has heard from God the impetus to give birth to Loppiano - and then the other citadels that have arisen in various parts of the world - contemplating, one day, the Benedictine abbey of Einsiedeln, with its church and the cloister of the monks, but also with the library, the carpentry, the fields ... There, in the abbey, God is at the center of life, in prayer and in the celebration of the Eucharist, from which fraternity, work, culture, irradiation in the midst of the people of light and social energy of the Gospel. And so Chiara, contemplating the abbey, was urged to give life to something similar, in a new and modern form, in harmony with Vatican II, starting from the charism of unity: a sketch of a new city in the spirit of the Gospel. A city in which the beauty of the People of God stands out first of all, in the richness and variety of its members, of the different vocations, of social and cultural expressions, each in dialogue and at the service of all. A city that has its heart in the Eucharist, the source of unity and life that is always new, and which presents itself to the eyes of those who visit it also in its lay and working, inclusive and open garb: with work of the land, the activities of the enterprise and industry, the training schools, the homes for hospitality and the elderly, the artistic ateliers, the musical complexes, the modern means of communication ... A family in which everyone recognizes children and daughters of the only Father, committed to living the commandment of mutual love among themselves and towards everyone. Not to be quiet outside the world, but to go out, to meet, to take care, to throw the leaven of the Gospel into the pulp of society, especially where it is most needed, where the joy of the Gospel is expected and invoked: in poverty, in suffering, in trial, in research, in doubt. The charism of unity is a providential stimulus and a powerful help to live this evangelical mystique of us, that is, to walk together in the history of the men and women of our time as "one heart and one soul" (cf. 4,32), discovering and loving each other concretely as "members of one another" (cf. Rom 12: 5). This is why Jesus prayed to the Father: "that all may be one as you and I are one" (Jn 17:21), and he showed us in Himself the way up to the complete gift of everything in the abysmal emptying of the cross (cf. Mk 15,34, Phil 2: 6-8). It is that spirituality of "us". You can do yourself, and others too, to joke, a test. A priest who is here - more or less hidden - did this test to me. He told me: "Tell me, father, what is the opposite of 'I', the opposite of 'I'? And I fell into the trap, and immediately I said: 'You'. And he told me: "No, the opposite of every individualism, both of the self and of the you, is 'us'. The opposite is us ". It is this spirituality of us, that which you must carry forward, which saves us from all selfishness and selfish interest. The spirituality of us. It is not only a spiritual fact, but a concrete reality with formidable consequences - if we live it and we decline its dimensions with authenticity and courage - at a social, cultural, political, economic level ... Jesus has redeemed not only the individual, but also the social relation (cfr Esort.ap Evangelii gaudium, 178). Taking this fact seriously means shaping a new face of the city of men according to God's plan of love. Loppiano is called to be this. And he can try, with confidence and realism, to become better and better. This is the essential. And from here we must always start again. This is the answer to the first question: to always start again, but from this reality, which is alive. Not from theories, no, from reality, from how we live. And when reality is lived authentically, it is just a link in this chain that helps us to move forward. Good morning, Pope Francis! I'm Xavier and I'm from Colombia. First of all thank you for your concrete love for our suffering people and for the hope it gives us. I am studying for a master's degree in Economics and Politics at the Sophia University Institute, which is based here in Loppiano. Dear Pope Francis, I greet you at the General Assembly of the Focolare (2014) you invited us to "make school" to "train new men and women on the measure of the humanity of Jesus". Loppiano wants to be a "city-school" where are not the roles, nor the differences in age or culture, but only the love between us that manages to build each other. We want Jesus, God-with-his-People, to educate and send us into the world. What fresh and creative contribution do you think can develop the training schools present here in Loppiano and an academic reality such as "Sophia" to build leadership that is able to open new paths? In Loppiano we live the experience of walking together, with a synodal style, as People of God. And this is the solid and indispensable basis of everything: the school of the People of God where the teacher and guide is the only Master (cf. Mt 23,10) and where the dynamic is that of mutual listening and the exchange of gifts among all. From here they can draw new impulse, enriching themselves with the fantasy of love and opening themselves to the solicitations of the Spirit and of history, the paths of formation that have flourished in Loppiano from the charism of unity: spiritual formation to the different vocations; training for work, for economic and political action; the formation of dialogue, in its various ecumenical and interreligious expressions and with people of different convictions; ecclesial and cultural formation. And this at the service of all, with the gaze that embraces all of humanity, beginning with those who in any way are relegated to the peripheries of existence. Loppiano open city, Loppiano city outgoing. In Loppiano there are no suburbs. It is a great wealth to be able to dispose of all these training centers in Loppiano. It is a great wealth! I suggest that you give them new impetus, opening them on wider horizons and projecting them onto the frontiers. It is essential, in particular, fine-tune the training project that connects the individual paths that most concretely affect children, young people, families and people in the various vocations. The basis and key of everything is the "formative pact", which is at the base of each of these paths and which has in its proximity and dialogue its privileged method. And here is a word that for me is also key: "proximity". One can not be a Christian without being near, without having an attitude of proximity, because proximity is what God did when he sent the Son. First God had done it when he led the people of Israel and asked the people: "Tell me, have you seen another people who have gods so close as I am near you?". So God asks. Proximity, proximity. And then, when he sends the Son to get closer - one of us - to come closer. This word is key in Christianity and in your charism. Proximity. We must then educate ourselves to exercise the three languages ​​together: the head, the heart and the hands. It is necessary to learn to think well, to feel good and to work well. Yes, even work, because it - as Fr Pasquale Foresi wrote, which played a central role in the realization of Loppiano's design - "is not only a means to live, but is something inherent in our being a human person, and therefore also a means to know reality, to understand life: it is a tool for real and effective human formation ". This is important - the three languages ​​- because we have inherited from the Enlightenment this idea - unhealthy - that education is to fill the head with concepts. And the more you know, you'll be better. No. Education must touch the head, the heart and the hands. Educating to think well, not only to learn concepts, but to think well; educate to feel good; educate to do well. So that these three languages ​​are interconnected: that you think what you feel and do, you feel what you think and do, you do what you feel and think, in unity. This is educating. The incisiveness and projection on a large scale of this promising commitment attest two incidents of the realities that have arisen in Loppiano in recent years: the "Lionello Bonfanti" business hub, center for training and dissemination of the civil and communion economy; and the academic experience at the frontier of the Sophia University Institute, erected by the Holy See, of which a local office - I am very pleased - will soon be activated in Latin America. It is important that in Loppiano there is a university center for those who - as its name says - seek Wisdom and set the goal of building a culture of unity. Culture of unity. I did not say uniformity. No. Uniformity is the opposite of unity! It reflects, starting from its founding inspiration, the lines I traced in the recent Apostolic Constitution Veritatis gaudium, inviting a wise and courageous renewal of academic studies. And this to offer a competent and prophetic contribution to the missionary transformation of the Church and to the vision of our planet as a single homeland and of humanity as one people, made up of many peoples, who inhabits a common home. Come on, come on like this! Loppiano does not want to remain closed in itself, wants to contribute to building a more united world. 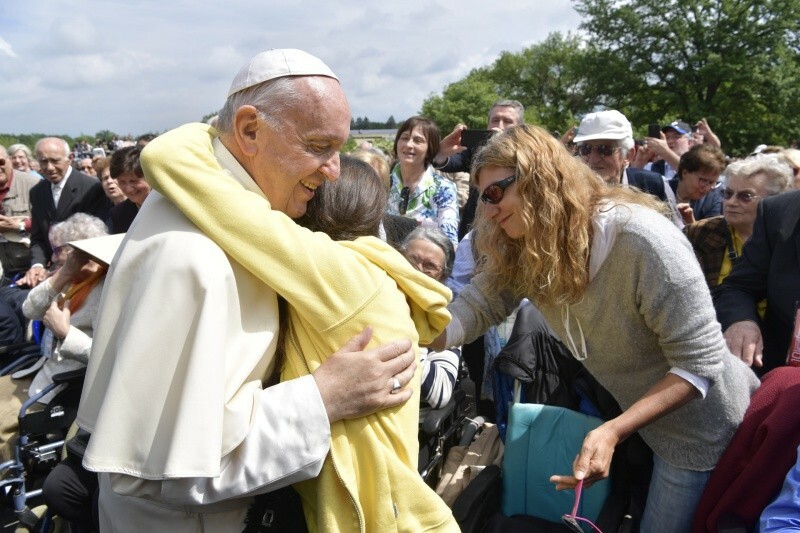 So here with us today, Holy Father, there are some migrant friends, who have had to leave their homes, their homes, their countries of their origins but they have found their home in Loppiano. Good morning Holy Father, we come from the Ivory Coast, from Mali, from Cameroon, from Nigeria, and after a long journey from our countries we arrived in Italy and then moved to Loppiano. For over a year we have lived side by side, we are from different countries, languages ​​and traditions, Muslim and Christian religions of different Churches. One can imagine that life in our home was not easy. Loppiano's life has helped us to overcome difficulties and see ourselves as brothers. "Beginning" was a word that helped us a lot. I take this opportunity to thank all the Italian authorities who have welcomed us. For us to be here and to be able to read this greeting and to thank her is a great honor. She is in our prayers. Holy Father, in the more than 50 years of Loppiano's life, Chiara Lubich has given different definitions: City Gospel and City school, City on the mountain and City of joy, City of dialogue and Mariapolis, City of Mary: they are all expressions that have accompanied and continue to accompany our steps. So today we would like to ask you, Holy Father, a word too. What is our "mission" in the stage of the new evangelization, but also what answer can we give to the challenges of our time as an opportunity for growth for all? I want to look up at the horizon and invite you to lift it up with me, to look with trustful fidelity and with creative generous to the future that begins today. The story of Loppiano is nothing but the beginning. You are at the beginning. It is a small seed thrown into the furrows of history and already germinated luxuriantly, but which must put strong roots and bear substantial fruit, at the service of the mission of proclamation and incarnation of the Gospel of Jesus that the Church today is called to live. And this calls for humility, openness, synergy, risk capacity. We must use all this: humility and risk capacity, together, openness and synergy. The urgencies, often dramatic, that challenge us from all sides can not leave us quiet, but they ask us the best, always trusting in the grace of God. In the change of era we are living - it is not an era of change, but a change of epoch - we must commit ourselves not only to the encounter between people, cultures and peoples and to an alliance between civilizations, but to win together the epochal challenge of building a shared culture of encounter and a global civilization of the covenant . Like a rainbow of colors in which the white light of God's love unfolds in a fan! And to do this we need men and women - young people, families, people of all vocations and professions - who are able to trace new paths to travel together. The Gospel is always new, always. And in this Easter time the Church has often told us that the Resurrection of Jesus brings us youth and makes us ask for this renewed youth. Always keep going with creativity. The challenge is that of creative fidelity: to be faithful to the original inspiration and together be open to the breath of the Holy Spirit and courageously undertake the new ways that He suggests. For me - and I advise you to do so - the greatest example is what we can read in the Book of the Acts of the Apostles: look how they have been able to remain faithful to the teaching of Jesus and have the courage to do so many "crazy things" "Because they made it, going everywhere. Because? They knew how to combine this creative fidelity. Read this text of Scripture, not once, two, three four, five or six times, for there you will find the path of this creative fidelity. The Holy Spirit, not our common sense, not our pragmatic capabilities, not our limited ways of seeing. No, go on with the breath of the Spirit. But how do you know and follow the Holy Spirit? Practicing community discernment. That is, gathering in assembly around the risen Jesus, the Lord and Teacher, to listen to what the Spirit is telling us today as a Christian community (see Revelation 2: 7) and to discover together, in this atmosphere, the call that God makes us hear in the historical situation in which we find ourselves living the Gospel. It is necessary to listen to God until we hear the cry of the People with Him, and we need to listen to the People until we breathe the will to which God calls us. The disciples of Jesus must be contemplatives of the Word and contemplatives of the People of God. We are all called to become artisans of community discernment. It is not easy to do it, but we must do it if we want to have this creative fidelity, if we want to be docile to the Spirit. This is the way for Loppiano to discover and follow God's way step by step in the service of the Church and of society. Before concluding, thanks again to all of you for the reception and the party! And together one last thing that I care to tell you. We are gathered here in front of the Sanctuary of Maria Theotokos. We are under the gaze of Mary. Also in this there is a harmony between Vatican II and the Focolare charism, whose official name for the Church is the Work of Mary. November 21, 1964, at the conclusion of the third session of the Council, Blessed Paul VI proclaimed Mary "Mother of the Church". I myself wanted to establish this year the liturgical memorial, which will be celebrated for the first time on May 21st, Monday after Pentecost. Mary is the Mother of Jesus and is, in him, the Mother of us all: the Mother of unity. The Shrine dedicated to her here in Loppiano is an invitation to put us in the school of Mary to learn to know Jesus, to live with Jesus and of Jesus present in each one of us and in our midst. And do not forget that Maria was a lay person, she was a lay person. The first disciple of Jesus, his mother, was a lay person. There is a great inspiration here. And a beautiful exercise that we can do, I challenge you to do it, is to take [in the Gospel] the most conflicting episodes of the life of Jesus and to see - as in Cana, for example - how Mary reacts. Maria takes the floor and intervenes. "But, father, [these episodes] are not all in the Gospel ...". And you imagine, imagine that the Mother was there, that she saw this ... How would Maria have reacted to this? This is a real school to keep going. Because she is the woman of fidelity, the woman of creativity, the woman of courage, the woman of patience, the woman of enduring things. Always look at this, this lay, first disciple of Jesus, as he reacted in all the conflicting episodes of his son's life. It will help you a lot. And do not forget to pray for me because I need it. Thank you!